Wilmington Brew Works is hoping to raise funds to place a marker on the grave of Christian Kruauch, who Delaware beer historian John Medkeff Jr refers to as “one of America’s earliest lager beer brewers and perhaps the most significant figure in the state’s brewing history”. As always I’d like to thank John Fusco for forwarding me the information. Wilmington, Delaware, November 6, 2018 – The gravesite of Delaware brewing pioneer Christian Krauch has been without a marker since his death 148 years ago. With the help of the public, Wilmington Brew Works is aiming to correct this historic oversight and honor the man known in his time as the state’s “Father of Lager Beer”. The brewery has been working with Delaware beer historian John Medkeff Jr. and Krauch descendants on plans to place a granite monument upon Christian’s cemetery plot at the Wilmington and Brandywine Cemetery. The organizers hope to raise the $2,700 needed for the memorial within the next several months. According to Medkeff, author of Brewing in Delaware (Arcardia Publishing), Krauch was “one of America’s earliest lager beer brewers and perhaps the most significant figure in the state’s brewing history”. Krauch got his start brewing ale in his Philadelphia saloon after his arrival from Bavaria in 1838. Two years later, John Wagner brought the first lager yeast from Germany to Philadelphia. By 1850, Krauch relocated his saloon and brewing business to the burgeoning city of Wilmington and introduced lager beer to the First State. He was a respected elder of Wilmington’s German community and helped found the singing club that would later become the Delaware Saengerbund. Though Krauch never expanded his business beyond his King Street saloon, he inspired and greatly influenced the generation of Wilmington brewers who followed him. With the popularity of and demand for lager beer dramatically increasing after the Civil War, Krauch disciples John Fehrenbach and Joseph Stoeckle helped transform what was once a modest occupation into one of Delaware’s most profitable industries. Fate would not be as kind to Krauch. With his humble brewing operation eclipsed by Wilmington’s larger breweries, he died penniless in 1870 and was buried in an unmarked grave. Over time, Krauch and his contributions to Delaware brewing history have been largely forgotten. Wilmington Brew Works recently paid homage to the pioneer brewer with a helles bock named “Krauch’s Creation”. The brewery is now advancing the tribute with the Christian Krauch Memorial Fund. The public is encouraged to help memorialize Krauch and celebrate Delaware’s rich brewing heritage by donating to the online campaign at www.plumfund.com/memorial-fund/krauch. In addition, Wilmington Brew Works will be donating a portion of proceeds from beer sales to the effort. 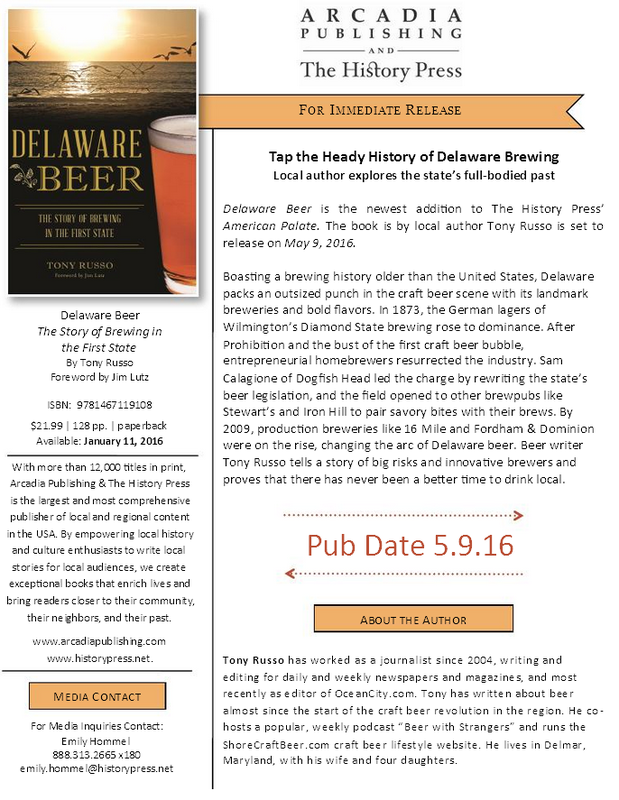 Below is information from the press release on Tony Russo’s (ShoreCraftBeer.com) up coming book entitled “Delaware Beer: The Story of Brewing in the First State” which is set to go on sale May 9th. Links for pre-orders can be found at the bottom of this post. About the book: Boasting a brewing history older than the United States, Delaware packs an outsized punch in the craft beer scene with its landmark breweries and bold flavors. In 1873, the German lagers of Wilmington’s Diamond State brewing rose to dominance. After Prohibition and the bust of the first craft beer bubble, entrepreneurial homebrewers resurrected the industry. Sam Calagione of Dogfish Head led the charge by rewriting the state’s beer legislation, and the field opened to other brewpubs like Stewart’s and Iron Hill to pair savory bites with their brews. By 2009, production breweries like 16 Mile and Fordham & Dominion were on the rise, changing the arc of Delaware beer. Beer writer Tony Russo tells a story of big risks and innovative brewers and proves that there has never been a better time to drink local.